> Why is the Sound of the Hit Delayed So Long? > The speed of sound at sea level, in dry 59° air, is 1116 fps. With the steel target 3000 feet (1000 yards) away, it takes 3000/1116 or 2.69 seconds for the sound of each hit to reach the shooter. It also takes nearly a second for the bullet to reach the target. How do you figure the time of flight as less than 1 second? Several of the impacts clearly look like the hits were low and left and the sound maybe from ricochet into the metal target. remember light speed (vision) is so much faster than sound. On some of the shots one can clearly see the glint of the bullet in its arced flight to the target. Nice presentation. What make of scope is being used? I would much rather see split-screen sports coverage of this (shooter and target) on TV. Rifle matches used to be national sporting events, at one time. Yet bowling, poker, and golf get network airplay. Go figure. So where is the range at,would like to shoot there. What brand of barrel is being used and what twist? Interesting opinion saying the 6mm can’t be accurate to 1000. 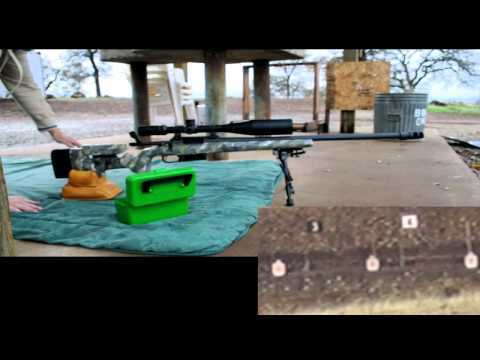 In one string last weekend I shot a 196-7x in out local 1000 yard F Class match with a regular 6BR. I’m by no means an accomplished shooter, but it’s my opinion the various 6mm rounds can deliver the goods at 1000 if the conditions are favorable. Pierre, I am fortunate enough to have property in which i can shoot in excess of 1600M. That is 1 mile in Americanese and works out to more than 1700 yards. The 6mmBR with a 105 Berger Hybrid doing 2950 is stable and VERY accurate to one mile. I shoot at 24″ steel saw blade gongs. One of our Canadian F-Class shooters, Richard Dreger, has dominated 1000M f-class competition with a plain old 6BR using 105 Bergers or 107 Sierras. I’m sorry and do not wish to sound impertinent, but your conclusions are so absurd as to make me question your credentials. Most factory rifles in 243 Win have barrels with 1:10″ twist. That limits the bullet weight to about 90 grains. Berger’s 90 gr Match BT Target bullet has a G1 BC of 0.411. If you instead use a .243″ barrel with a 1:8″ twist you can use Berger’s 105 gr Match Hybrid Target bullet. It has a G1 BC of 0.547. Speaking of the Berger Hybrid.. I regularly shoot a 6XC between 600 and 1,000 meters with 105/107 gr. projectiles with very good results, so long as I do my bit! … The very first law of ballistics: Be humble. Nobody has any doubts about the possibilities of the .338 LM but this article is about the .243 Winchester. It also takes about 1.25 seconds for the bullet to get from the rifle TO the target. So the total time from firing the shot to hearing the clank is nearly 4 seconds. It is a wonderful thing to see my French shooter friends posting notes. Merry Christmas to you all! Back to the rifle at hand. How did you like the handling with addition of the muzzle brake? I got one on my Eliseo RTS in .308 and it’s made a world of difference. The gun handles more gently and jump is now so well mannered it’s no trouble to spot my hits which is particularly useful when competing in unknown distance matches. hello, i’m a french shooter and i’m moderator on the tirmaillyforum. I’m afraid, but the “Pierre Delhoume” writing here is not the real one. Pierre belongs to the neighbough house (=Police) and not to the “gendarmerie” (GIGN). I’m sorry for the US shooters, they have been victims of the “french polices war”. Pierre shoot regulary at 1000m with a PGM UR chambered in….243W! His real name is Deloume with no “H”. I beg the US shooter’s pardon for this silly episode. Votre manip est à chier. L’adresse GIGN qui sort quand on passe sur le nom de Pierre, ça fait tâche. Son nom mal orthographié, encore plus. Pour l’intervention, le GIGN est sans doute parmi l’élite, pour la manipulation sur internet, vous en êtes encore au niveau du fishing des ivoiriens. What a pity! pour conclure en Anglais. as a frenchman, I own 2 .243 rifles with fast twist barrels, all of them shooting at 900+ meters…..I didn’t know it was impossible!…. Guys, apparently a “practical joke” has been at work here. The real Pierre Deloume works for one French law enforcement organization and actually shoots a .243 Win at long range. It appears that a rival French LEO has been posting these misinformed comments about as some kind of spoof. So we can all relax now. I’ve blocked the IP address of the practical jokers in France. Those French have at least a sense of humor. Just relax, guys! Can’t you take a joke? Can’t we all get along, as Rodney King once asked? Monsieur Pierre Deloume (the “h” was an inside joke)is particularly well known for his proverbial sense of humor, his joyful character and the extreme tolerance in his consideration of his neighbor’s opinions. Should he consider himself the innocent victim of a cruel joke, he would have been the first to log on this site and ask for the removal of his alleged statements. He chose instead to take them for what they were: practical jokes, without any intent to libel or denigrate his competences or his position in the Department of Public Safety. The outlandish claims that the 6mm was unable to reach 1,000 yds should have been a clue for everyone having a fair knowledge of long range shooting, and anyone ever having heard about Monsieur Deloume’s skills with a target rifle should have guessed that jokers were at work, the terribly broken English or the very loudmouth style of the outrageous statements should have been another clue for anyone remotely acquainted to Monsieur Delhoume’s long experience with guns and long range shooting. This gentleman didn’t feel insulted or diminished by any mean and it is highly regrettable that some people in his forum chose to take the matter in their own hands and to overreact to what is just a gentle warning not to take oneself too seriously. Nobody is a sacred cow, and everybody can make dumb statements, Monsieur Delhoume is certainly no exception. No need to involve other LE units or to disclose IP addresses or any relevant confidential data. The brake seems to work very well. Surprised it has only two ports, but they are obviously doing the job!